Throughout my experiences so far at cam, Christ has continued to reveal himself to me in ways that are little and subtle, but also in ways that are exuberant. One such way is from the talk that Joe Bland gave us last night on the Liturgy and the Eucharist. Joe is a fantastic man who really lives and shares his Catholic faith. 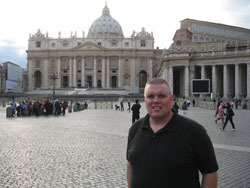 Until this summer he has taught and been the chair of the religion department at Trinity High School in Whitesville, now he is moving across the parking lot to become the Director of Faith Formation for St. Mary of the Woods Parish where my former pastor Fr. Gerald Baker is now pastor. Joe has worked with youth for eleven years and is an amazing presenter/speaker. It was amazing to listen to him. Joe began his talk by covering the different covenants that God has made with his people, the symbols of them and what they were for. This stood out to me, because it is exactly what I am covering in our Faith Exercise each week at camp on Tuesdays. One of my great loves in Dr. Kevin Schemenauer’s Class this past year at Bishop Bruté is when we discussed Covenants, thus this year at camp I jumped at the opportunity to teach the kids about the covenants. It is amazing how the Holy Spirit continues to work in all of our lives and how each thing seems to link together. (More on that in another post!) Throughout Joe’s talk I kept having thoughts pop into my head that I wanted to expand upon and explore. Thus Joe Bland got me thinking. As always, please pray for me! I am praying for all of you!